Biotech-Numérique / Bio meets Digital comprises an exhibition and a series of events about material innovation and fashion-tech, presenting the work of several French and Dutch designers, whose works deal with processes of digitalisation, biomimetics and beyond, at crossroads between technology and biology. 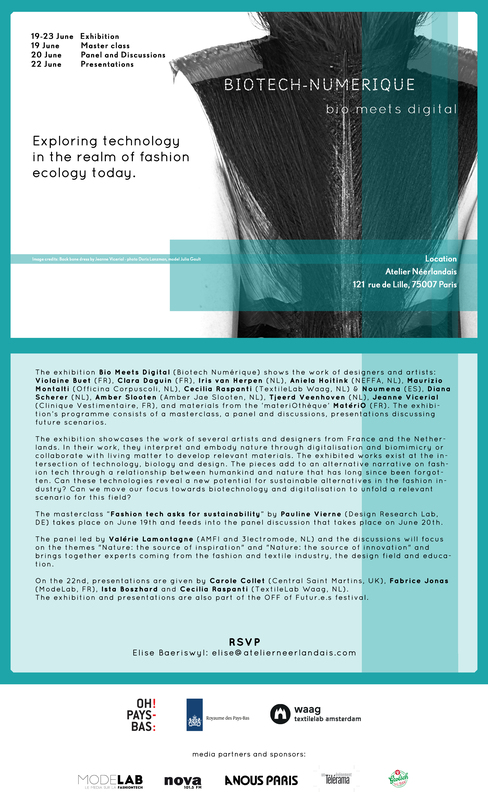 Can technology be employed to refine the potential offered by sustainable alternatives within the fashion industry? And if so, how? Maurizio Montalti (Officina Corpuscoli / MOGU) will contribute to the overall programme by both presenting some of the mycelium-based work as part of the exhibition “Bio Meets Digital: Exploring technology in the realm of fashion ecology today“, as well as by joining the discussion panel and the follow-up workshops and round tables. Participants include, among others Tjeerd Veenhoven, Emma van der Leest, Jeanne Vicerial, Ista Boszard, Cecilia Raspanti, Marion Lévy. Moderated by Valérie Lamontagne. Biotech-Numérique is organised by Waag Society‘s TextileLab Amsterdam in close cooperation with Atelier Néerlandais, and is part of Oh! Pays-Bas, the 2017-2018 season dedicated to Dutch culture in France and initiated by the Embassy of the Kingdom of the Netherlands in Paris.